Exclusion (or its derivative, exclusive) I see as having positive and negative meanings. In the marketing world, exclusivity is often desired, and the word ‘exclusive’ is used to attract consumers, to make them feel special (like they have some sort of elite status). Exclusivity can have its upside for sure. Socially, the upside of exclusivity can help people feel like they have status. Social exclusivity can be safe, predictable and foster a sense of belonging… as long as you are part of the group. SO what if you are the excluded? Implicit in the word ‘exclude’ is the idea of not including something or someone. Socially, that flip is the experience of being on the outs: Potentially a lonely place to be. So, back to my original question… what does ‘Inclusion’ mean to you? Take a look at the artwork featured at the top here. It is a piece by artist Anne-Denise Mejaki titled “We All Belong”. It happens to be one of my favourites by Ms. Mejaki. 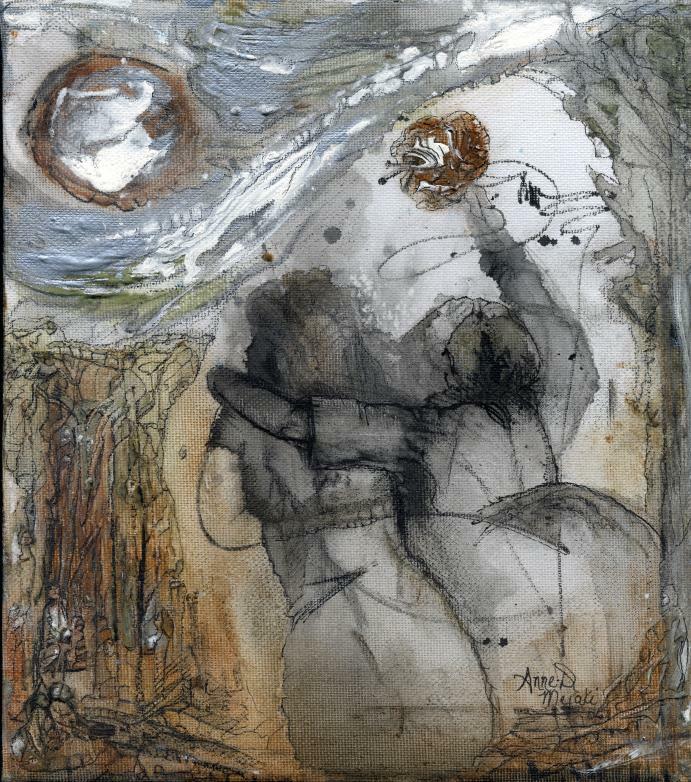 Lots of her art is filled with hidden treasures: small images intricately blended into a larger theme. This one in particular features all kinds of examples of social belonging. I always feel good when looking at it. I guess the concept of inclusion, or belonging, is close to my heart and I believe she has done an amazing job of illustrating that in “We All Belong”. This piece has been used for fundraising at public education events with the Canadian Mental Health Association in North Eastern Ontario, to raise awareness of mental health. Why mental health you might wonder? The emotional impact of social exclusion can be devastating particularly if the exclusion involves aggression. Think about how often we hear about bullying in the school-age population; aggression that now includes persecution and exclusion in the cyber world… many times having tragic outcomes. Even without aggression though, feeling excluded hurts and can lead to mental illness. As you go on with your day today, I hope you find a small way to include someone in your world. The smallest gesture of a smile or a compliment can lift someone’s spirits and help them feel connected. Feeling connected can go a long way toward preventing loneliness and promote validation. If you want to know more about the “We All Belong” painting, click here for the story of the work, written by the artist. This delicious recipe features anti-inflammatory cinnamon. The Marrakesh spice mix is used in the cuisines of Morocco and the eastern Mediterranean. If there are any left over chickpeas, you can turn them into a tasty salad snack the next day by adding a dash of balsamic or red wine vinegar, some almonds or pine nuts, olives and crumbled feta or goat cheese. Combine. Store in a covered container in a cool cupboard. Makes about 2/3 cup. Heat oil in a frying pan over medium heat. Add onion and cook 5-7 minutes until soft but not brown. Stir in garlic and spice mix. Cook for a couple of minutes. Add chickpeas and stir to coat. Heat through about 5 minutes. Add tomatoes and herbs, heating just to blend flavours. Season to taste. Serve at room temperature. 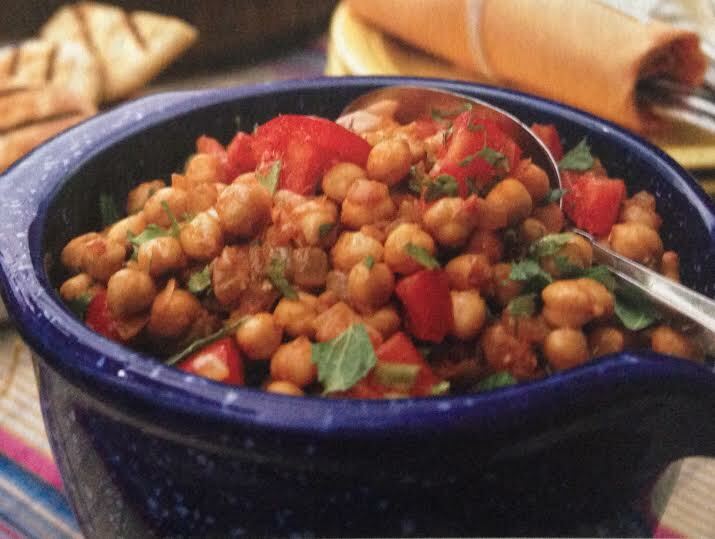 Tip: The chickpeas can be made up to 2 days ahead; reserve ½ the herbs to add at serving time. Tip: Marrakesh Spice Mix is great in a chicken marinade. Check out Marrakesh Chicken in our blog recipes from January 2014. If you haven’t had a chance to try the pumpkin muffin recipe ( from Michelle Weir) posted on our blog this week, give it a try and read on for more interesting facts and ideas regarding Fall Eating. 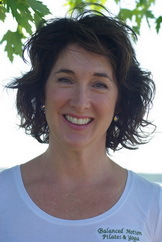 There are still a few spots available for Michelle’s Workshop next Saturday ( October 3rd) at Balanced Motion. Click here for more information regarding Michelle’s Workshop and Click here for our Friday Education Piece. 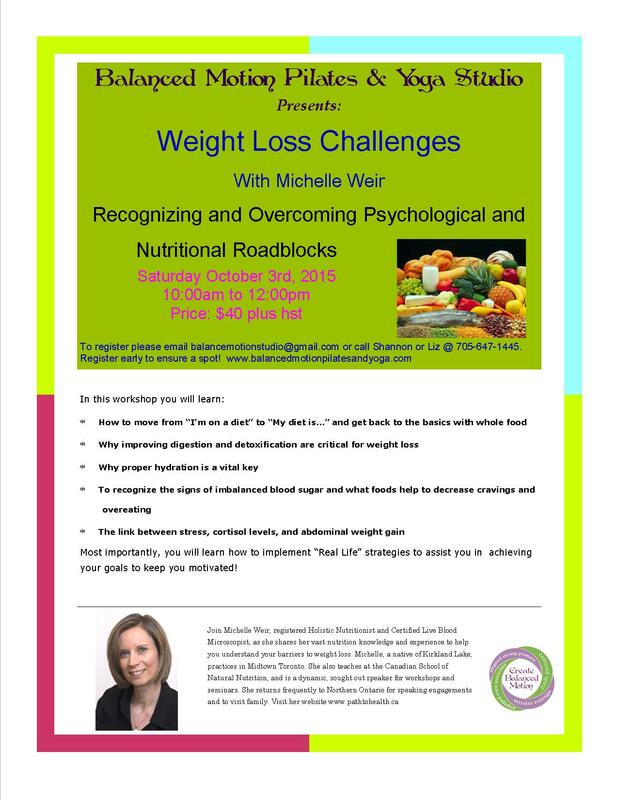 On Saturday October 3rd from 10:00 – noon At Balanced Motion we are very pleased to welcome back Michelle Weir Holistic Nutritionist for a great workshop entitled Weight Loss Challenges – Recognizing and Overcoming Psychological and Nutritional Roadblocks. If weight loss is your goal, you will gain fantastic tools and tips to manage your weight. If weight loss is not your primary goal , you will still benefit from the information that will be presented in this Workshop. Michelle will present strategies that will address all of these issues helping us to reach our weight loss and/or wellness goals. For complete information, please click on Michelle’s picture. Michelle Weir, Holistic Nutritionist, provides this Week’s Recipe. Pumpkins are a superfood and jam-packed with nutrients. Studies show that the carotenoids in its orangey flesh improves your skin, eyesight and fights inflammation and the common cold with it’s antioxidant properties. With more fiber and protein than sugar, it’s a natural appetite suppressant and fat-burner. There are still a few spots in Michelle’s Workshop on Saturday October 3rd at Balanced Motion – Weight Loss Challenges – Recognizing and Overcoming Psychological and Nutritional Roadblocks. This Workshop will be jam-packed with great information that will assist you with all of your nutritional goals ( improving digestion, increasing energy, balancing blood sugar, dealing with cravings, etc…..). Call the Studio at 705 647 1445 if you would like to register. Pumpkins are a great source of nutrition. They are low in calories, fat and sodium and high in fiber. They are loaded with beta-carotene, which the body converts to vitamin A, B vitamins and potassium. The seeds are very high in protein and are an excellent source of zinc and iron. Cream butter and sucanat together. Add eggs and mix again. Mix the brown rice flour, baking soda, baking powder, salt, cinnamon, allspice and nutmeg together. Add to the wet mixture and mix. Add the coconut milk, mix again. Grease muffin pan and fill each cavity ¾ full. Bake at 325 degrees for 30-35 min or until muffins spring back when touched in the centre. The fall is such a busy time as we get back into our routines and the kids go back to school. 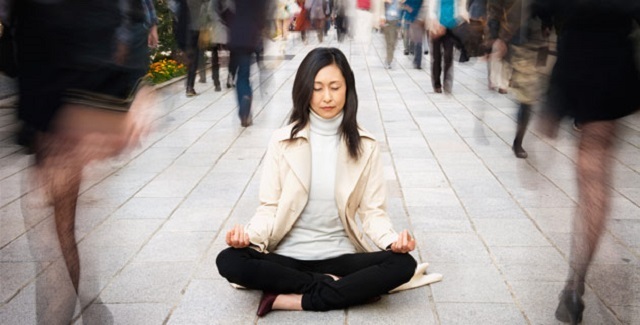 Often life can feel a bit chaotic, even more reason to create some Zen time. Click here to read this weeks education piece. It is about creating just that, Zen! 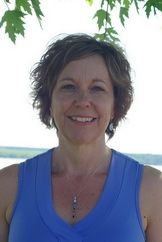 Sherry Morton-Jibb PTS. RYT. FIS. NWS, Certified Pilates Mat & Reformer Instructor Registered Yoga Teacher. 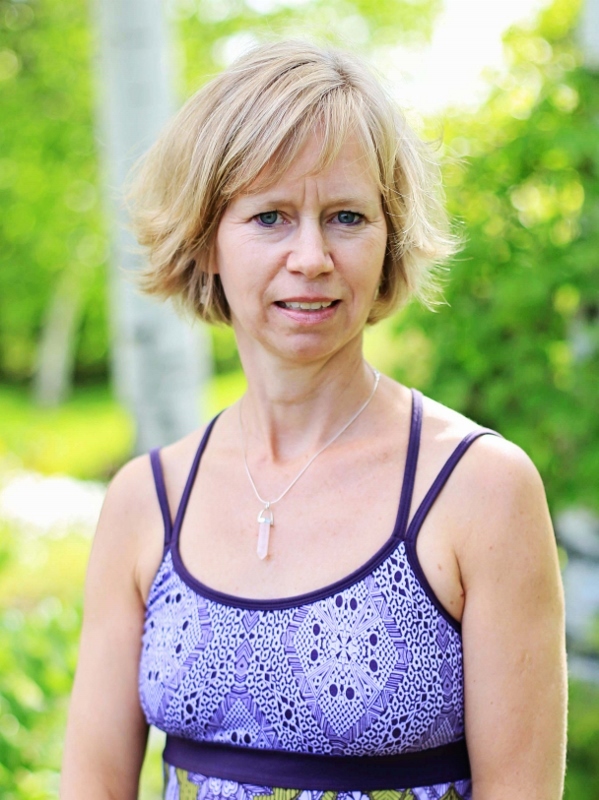 She co-owns Balanced Motion Pilates and Yoga Studio in New Liskeard, ON. As we transition into Fall, our back bodies tend to be tight with the changes in the weather. Click here to watch a quick video showing you how to stretch out and lengthen your hamstrings. 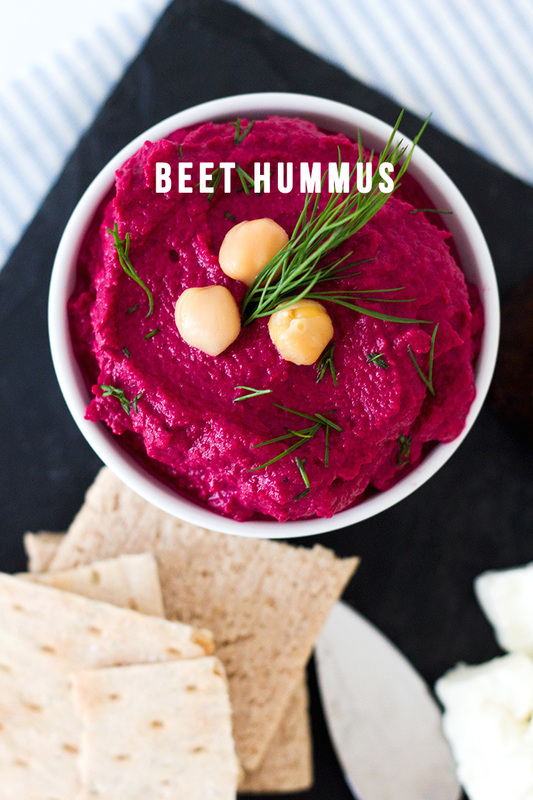 It is beet season so this week why not add some roasted beets to your Hummus, yummy for sure! Beets have many health benefits; they are high in vitamins and minerals like the B vitamin folate, manganese, potassium and copper. They’re also high in dietary fiber. Beets contain healthy amounts of magnesium, phosphorous, vitamin C, iron and vitamin B6. Preheat oven to 400 degrees and place chopped beets on a baking sheet with a bit of olive oil. Roast until tender. In a food processor, add chickpeas, lemon juice, minced garlic, tahini, paprika, sriracha, salt, olive oil and salt. Set aside. When the beets are cool enough to handle, add them to the food processor and purée all ingredients. You can also leave it a bit chunky, if you prefer the texture! Serve in a bowl with chopped walnuts and dill to garnish! It’s best paired with quality crackers and feta. Nutritional Information per 1/4 cup serving: Calories: 89, Fat: 3.8g, Sodium: 164.2mg, Carbs: 11.5g, Fiber: 2.3g, Sugar: 0.9g, Protein: 3.1g. In Wednesday’s blog I talked about the concept of Ayurveda. Click here for a great education piece from mindbodygreen that describes how our bodies react to the Fall Season and how we can have a fantastic Fall season following the principles of Ayurveda. 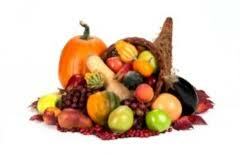 Fall is upon us with all of its wonderful colours, flavors and, aromas. Although there are many wonderful aspects to fall, many people find the transition from summer to fall a little challenging. Our bodies our closely linked to the cycles of nature and as nature prepares for a long winter season so do our bodies. This connection to nature is described in detail in the Science of Ayurveda. 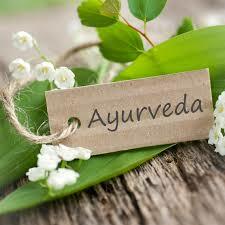 Ayurveda is a 5000 year old system of natural healing that originated in India. It is becoming more known in the west through the work of Dr. Deepak Chopra, Dr. Andrew Weil and many others. .
With shorter days, less light, and lower temperatures, we may feel a little less energetic, like we need to linger in bed a little longer in the morning or need a nap in the afternoon. This “change” in nature is encouraging us to slow down after a busy summer. However, for many of us, the fall season is quite busy as we get the kids ready for school, prepare for fall sports/activities, prepare the house/garden for the winter and generally wind things down. For those that find the transition a little challenging or for those that want to enhance this time, here are some suggestions…. 1. Be active in some way every day. In addition to all of the wonderful benefits of exercise such as improved overall health and fitness , exercise in the fall becomes that much more important. As the sunlight starts to decrease in the fall so do our serotonin levels (the “feel good” chemical) Exercise increases the level of serotonin which boosts alertness. As we come in to the fall season our bodies crave warm and creamy foods such as soups, casseroles and roasted vegetables. Dig out your slow cooker and favorite soup and casserole recipes and enjoy. Combine healthy eating and physical activity by taking a walk to the Farmer’s Market on Saturday morning to purchase some wonderful fall veggies and other goodies. 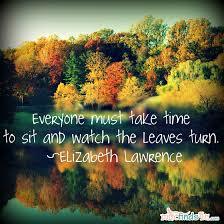 Give yourself permission to slow down a little in the Fall. Yes, it is difficult with all of the demands, but also know that as we our speeding up, we are fighting the natural tendency of our body to slow down. Allow yourself that extra hour of sleep by going to bed a little earlier, or take that nap Sunday afternoon . Have a happy and healthy fall season!